You are legally responsible for making sure you do not commit UI fraud. Failure to adhere to state UI requirements could result in serious consequences that will negatively impact you and your family. The government may prosecute you, garnish your wages, force you to repay UI benefits (plus penalties), withhold income tax refunds, and deny you eligibility for future UI benefits. Read all of the information that is available to you before you file a claim for benefits. This will reduce the likelihood of errors that may result in an overpayment, a delay, or denial of future benefits. Review all statements you receive from the New Mexico Department of Workforce Solutions for accuracy, paying particular attention to your work history and wages. Tell the truth about your last employer, dates of employment, and the reason you are no longer employed when you initially file a claim for benefits. Report all part-time and temporary work with the correct dates of employment. You must register for work services within 14 days of filing a claim for UI benefits, unless exempt by law. Registration includes an orientation video which you can watch online or at your local New Mexico Workforce Connection Center. To fulfill this requirement, go to the New Mexico Department of Workforce Solutions website at www.dws.state.nm.us, log on to Workforce Connection online system, complete the “Personal Profile” and click “SAVE.” The orientation video will start immediately. When the video is over, click “SUBMIT” to complete your work registration requirement. This website also provides valuable resources to aid your job search, including job referrals, resume building, and re-employment services. A work search plan will help you stay organized and focused as you look for a new job. Your local New Mexico Workforce Connection Center and www.dws.state.nm.us are both great resources that can help you develop a plan, as well as provide you with information about different types of jobs, their availability, and how you can enroll in training programs. 6. Actively search for work. You must search for work each week that you file a claim for benefits. If you fail to do so, you may be denied benefits until you confirm that you are actively looking for a job. Make sure you provide the New Mexico Department of Workforce Solutions with accurate and truthful information about all weekly earnings and any other income you receive, such as money from a pension or retirement account. Providing misleading or inaccurate information on a claim for benefits may be considered UI fraud, which is punishable by law. You must accurately report your gross wages (before taxes are taken out) each week that you work and certify for benefits – even if you don’t get paid until later. Be sure to accurately report all earnings (from part-time and temporary work) during your weekly claim certification – regardless of whether you are paid in cash or by check. If you collect more UI benefits than you are entitled to because of your failure to report earnings, you may face serious consequences. As soon as you begin working full-time, you must discontinue certifying for benefits - unless your gross wages are less than your weekly UI benefit amount. Do not wait until you receive your first paycheck to discontinue certifying. Remember, every time you certify for benefits you are stating that you are able, available, and actively seeking work. Employment records are verified by the New Mexico Department of Workforce Solutions, which uses state and national resources to track new hires. People who receive improper payments based on fraudulent information face serious consequences. You have a legal responsibility to know and follow New Mexico’s rules if you collect UI benefits from the state. If you need help navigating the UI system, or if you have any questions about the requirements of receiving UI benefits, call a UI Call Center representative at 1-877-664-6984 or visit our website at www.dws.state.nm.us. 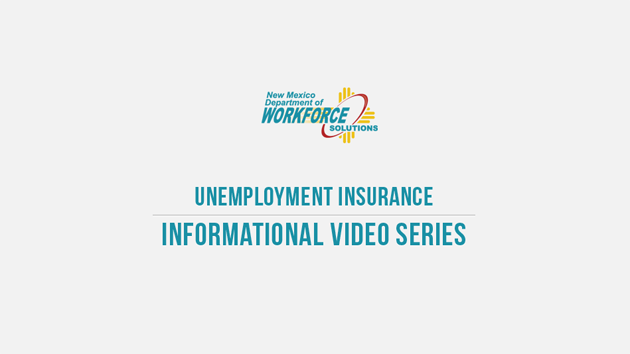 "What You Should Know About Unemployment Insurance (UI)" includes several topic areas for both individuals receiving benefits and employers paying Unemployment Insurance taxes in New Mexico. Spanish versions available for select videos. In addition to the information available on the above pages, each topic area will also include a short video. These videos may also be viewed on the New Mexico Department of Workforce Solutions YouTube channel.